President Trump toured a tank factory situated in Lima, Ohio, on Wednesday and addressed a crowd with new comments about General Motors’ Lordstown plant on the other side of the state. According to a Bloomberg report, the president told the crowd that GM should sell the facility. He argued the automaker needs to do whatever it can to reopen the plant. “Get it open now. Don’t wait,” he added, taking a swipe at the fact labor negotiations between the United Auto Workers union and GM will not begin until later this year. The final outcome of the plant will be decided in labor negotiations as the current contract expires this September. For now, the plant is idle and not officially closed. A GM spokesperson told Bloomberg there may be an offer to sell the plant on the table, however. 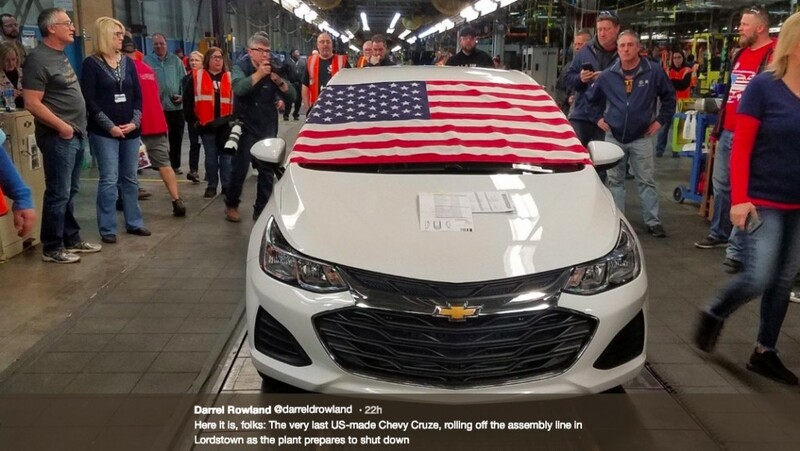 The company admitted it’s received “inquiries from interested parties related to the Lordstown complex and the Chevrolet Cruze.” The automaker will evaluate any viable business opportunities related to the facility, but first, the UAW and GM need to hash things out. President Trump’s comments come after he took to Twitter this past weekend to call for GM to reopen the plant or sell it. He also took aim at the local UAW 1112 president, David Green, and called on the leader to produce results for the workers. The possibility of selling the Lordstown plant to another business was also hinted in comments from the Ohio Governor, Mike DeWine. The governor said his office remains in constant contact with GM and the automaker told him earlier this month it may have more news to share in the next few weeks. DeWine said there’s something going on behind the scenes, but the state is not aware of anything official. It could be a good fit for emerging electric brands like Tesla, Rivian, and Fisker. The one thing they are missing that legacy automakers have is manufacturing capacity. It could work even better if the alleged GM investment in Rivian occurs – potential manufacturing partnership. Fisker had taken over a former GM facility in Wilmington, DE but had to back out when they fell on hard times. The last time I rode past it it was being torn down. Tesla can’t afford it given they are building a factory in China. Rivian has a factory already. And who knows about Fisker and their plans. It’s great for Trump to say sell it. It’s another thing for someone to what a large car factory outside of other car companies. What I think will happen is GM in the 11th hour will save Hamtramck or Lordstown, but not both. And my money is on Hamtramck. It will look like a win-win for the UAW and GM. what makes you think DHAM? 1) DHAM is literally in sight of the Ren Cen. Most industrial companies have a manufacturing presence near their corporate headquarters. 2) DHAM recently got $1 Billion in new investments which included new body shops and staging areas. 3) DHAM was supposed to get a new paint shop, but it was cancelled last fall. 4) GM extended production of a relatively low volume car until January. That places the idling date past the new contract. It would have been easier just to work a lot of OT until June then idle the plant. 5) There is not a lot of talk about anyone wanting to buy DHAM or GM looking to potentially sell it. This indicates that GM wants to hold on to it. The last thing they need at Lordstown is a start up EV mfg with a unclear future or unstable leader. They would be better off with Amazon or UPS coming in. Congressman Tim Ryan who has been voted into this area time and time again yet has done nothing to save this plant or do anything to keep GM here. He takes the union money but gives so little in return. He replace Jim Trafficant when he was put in jail. This was his chief of staff. Good time Tim has even pondered running for speaker of the house. Yet he took a tour of capital venture investors around this area made a couple stops then took them to Michigan and Indiana? Who voted him in Ohio or Indiana? Lordstowns is a heavy Democratic area that has yet to learn how to attract or keep jobs. The crime is off the map and poverty is rampant in this Youngstown area. Debts are increasing. You want the point of who has done nothing to save the jobs here they lay at the feet of Tim Ryan. He has been on the front line of this just as Sharrod Brown and both failed to do anything about this. It was far from a secret things were in decline. Kasich the past governor was also at fault. He just went nuts. Note we also have lost Ford plants and Chrysler plants in this area too. Amazon or UPS with $12-$14 Hour jobs? Fisker $0 per hour when it tanks? The pay goes up at the others as that is just starting. Also the cost of living is much cheaper in Ohio. A $200,000k house here is $750,000k in CA and you get a basement as well as no less an acre of property or more. Not to mention much lower taxes. As if GM needs the advice of a trust fund TV celebrity with FIVE bankruptcies under his belt. I wonder if he could get his buddy Putin to bring in some Russian people to buy it, after all he was a Russian elected President..